Sushi and Sashimi knives are extremely sharp, hand-crafted for a specific task, and require very specific instructions to handle and maintain. 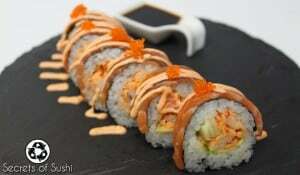 What is the difference between sushi and sashimi knives? 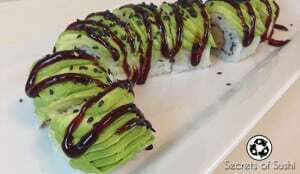 There are many steps to making a sushi roll: cutting vegetables, cutting fish, and then cutting the roll itself. A sushi knife is multifaceted for cutting during all three, but a sashimi knife is made specifically for cutting fish. 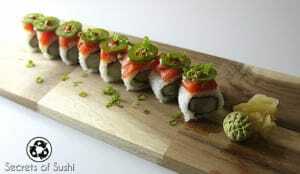 Most sushi knives are made of high-carbon steel (not stainless steel). This means that the steel rusts easily, but is capable of attaining a much sharper edge. One unique trait of sushi and sashimi knives is their single beveled edge. These knives are sharpened so that only one side holds the cutting edge and the other side remains flat. The flat edge is there so that food doesn’t stick to the knife. 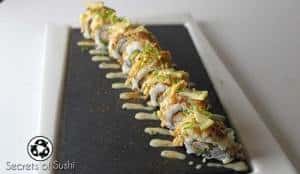 It is rumored that most sushi knives are right-handed because it is better to cut fish with, where as left handed knives are better for cutting shell fish. Left handed knives are usually custom made and very expensive. Another unique quality of the knives is the handle. Traditionally, the handle was shaped with a “D” cross section. This was to make using the knife for long periods of time more comfortable. The handles are made with various types of wood and usually a bone cap towards the top. 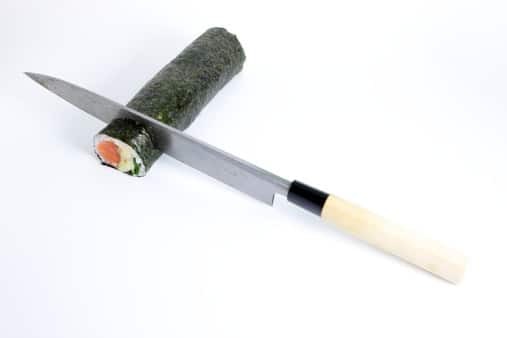 The last unique trait of sushi and sashimi knives (which can also be seen in Japanese Katana) is the Tang. The tang refers to the metal portion of the handle that runs down the length. There are full tang knives and half tang knives. Full tang runs the entire length of the handle where as half tang does not. Yanagiba(willow-shaped)- the “standard” sashimi knife. Good for cutting sashimi and sushi rolls. Deba– closest to a meat clever, the Deba is good for cutting through bones and cartilage of fish. Usuba– the ideal vegetable knife, used more for fine cuts and peeling. 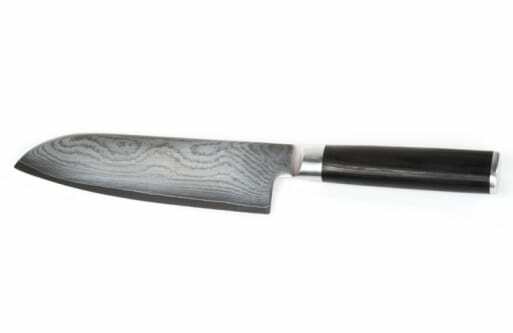 Santoku (three virtues)- used for fish, meat, and vegetables. This is a western-style knife that was designed to be a “one size fits all.” It is not a traditional knife, but it’s used a lot in Japanese homes. While there are a few more types of knives used in the sushi industry, they are extremely rare and absolutely accessory. 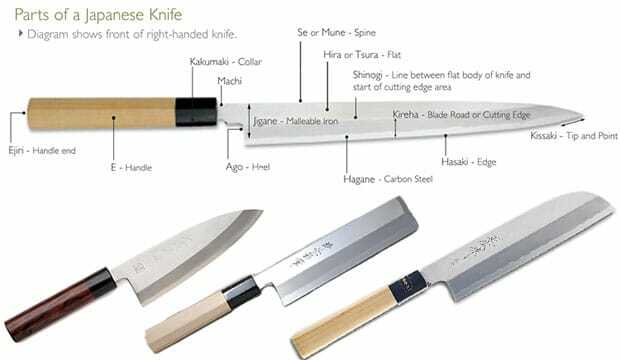 The above listed are considered the “essential” knives for sushi. Click on my page to learn about the proper knife etiquette for sushi and sashimi knives. This page will go over the general use of knives, how to hold them, and a few interesting facts about Japanese etiquette vs. Western etiquette. In this section, I will go over the Do’s and Don’ts of buying knives. There are plenty of websites out there that will tell you that they sell “high quality, cheap knives.” But I assure you, the terms “high quality” and “cheap” don’t belong in the same sentence when it comes to sushi knives. You definitely get what you pay for. 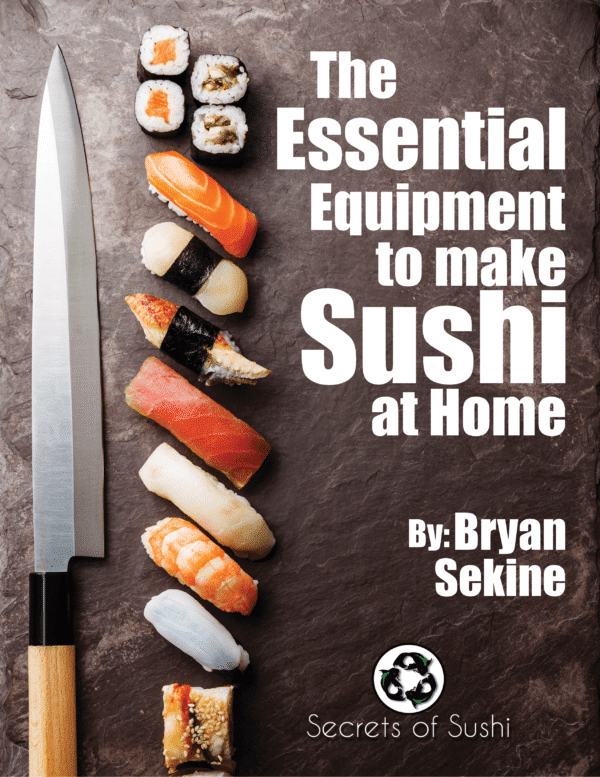 When should you buy your own sushi knife? 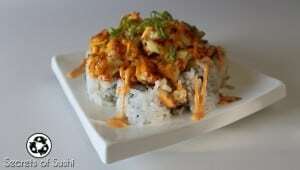 Honestly, I went through two years of working at different sushi bars before investing in one of my own. Owning your own knife isn’t necessary, but it is convenient. Don’t buy stainless steel sushi knives! No questions asked. Stainless steel knives used for sushi are not as efficient, produce more mess than they are worth, and are not traditional. Don’t buy them. If money isn’t an issue, buy a Honyaki. 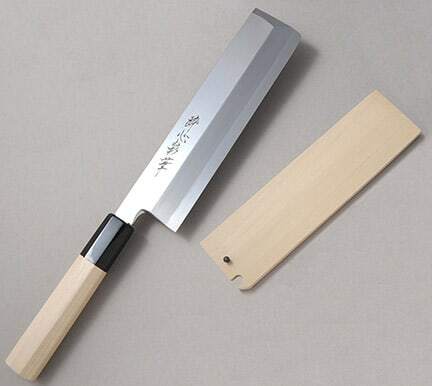 A Honyaki knife is typically a higher quality knife. Made by a single piece of steel and using a more traditional crafting/cooling process, a honyaki will have a higher carbon content without sacrificing it’s durability. Though, you should be careful of retailers that claim their knives are honyaki. Do a little research on the makers of the blades and always watch the price point. I would say that a good starting price for a true honyaki is about $500USD. What type of knife should I get? This is entirely up to what you plan on doing with it. As a general rule of thumb, a Yanagiba will be the only knife that you will need (other than the knives you already own). However, as you start to make sushi more often you might want to consider getting other sushi and sashimi knives, such as an Usuba or Deba. Previously, I thought that a full tang was the only way to go (mostly because my fondness with blades started with the Katana). However, unless you are planning to go into combat or use your knife to pry open your car door (please don’t), you don’t need a “full tang.” In fact, there are some chefs that argue that a full tang knife has higher sanitation risks! There are several styles of knives that have a full tang with two pieces of the handle riveted onto it; these are typically seen in European knives. Traditional Japanese knives use a partial tang, or a “rat tail.” This means that the metal from the blade is tapered down and surrounded by the handle. The main reasoning for this is to secure the blade to the handle and add more balance to the weight of the blade. If you order a knife and you can see a gap between where the neck ends and the collar begins (this is the bone or horn cap on the handle), send it back. The blade needs to be completely seated within the handle when you purchase your knife. In my experience, seeing that gap leads to the the blade becoming completely unseated over time. The techniques of hand crafting sushi knives date back to the 14th century-with many of the techniques (from sword smiths) going back as far as 1000 years ago. During the modernization of Japan (19th century), carrying Samurai swords became illegal. As such, the majority of sword craftsmen turned their business towards crafting sushi knife cutlery. As with every art form in Japan, there are hundreds of years of accumulated knowledge and experience that are passed down from master to apprentice. Specific rules and procedures put into place and secrets of the trade passed on by personal exposure- Creating sushi knives is no exception. In Japan, there is one region that is world renowned for their metal work- Sakai City. Sakai has been known for their metal work since 500 A.D., after one of Japan’s emperors died and decreed that a temple be built in his name. After the temple was complete (many years before his death), many of the blacksmiths settled around Sakai permanently. Having all of the best blacksmiths of Japan living in one place, it’s no wonder that Sakai become famous for their work. Starting with swords, then rifles after the Portuguese introduced them, and then eventually sushi knives- Sakai, to this day, is known for their high quality metal work.